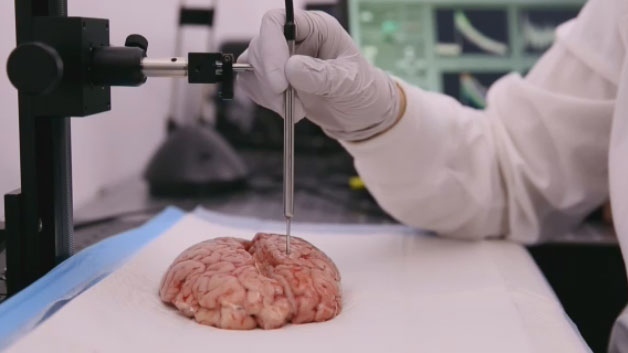 A fibre-optic probe can detect errant cancer cells within healthy tissue during brain tumour surgery with close to 100 per cent accuracy and sensitivity, reducing the risk of recurrence and thereby increasing a patient’s survival time, say the Canadian researchers who developed the device. The hand-held, pen-like instrument, known as a Raman spectroscopy probe, is able to differentiate between cancer cells and healthy cells by measuring the way each reflects laser-based light. The process, which involves optics and computer science, takes less than 10 seconds — allowing neurosurgeons to target malignant cells for removal without having to send a tissue sample to the pathology lab and wait at least half an hour for its assessment. “Minimizing, or completely eliminating, the number of cancer cells during surgery is a critical part of cancer treatment, yet detecting cancer cells during surgery is challenging,” said Dr. Kevin Petrecca, the chief of neurosurgery at the Montreal Neurological Institute who helped design the probe. In 2015, the researchers published results of a study in which the probe was used during brain tumour surgery in patients; the device was found to have about 90 per cent sensitivity in locating cancer cells that had spread from the tumour and invaded nearby normal tissue. The probe has since been refined and is now coupled with additional optical technologies that have improved its accuracy and sensitivity, making it capable of pinpointing not only primary brain cancer cells, but those from tumours elsewhere in the body that have spread, or metastasized, to the brain. In a study of 15 brain tumour patients, published Wednesday in the journal Cancer Research, Petrecca and his colleagues found the instrument’s sensitivity in locating stray cancer cells during surgery had improved by about 10 per cent. “We really see this being used for many, many cancers,” he said, including determining if there has been localized spread of cancer cells from tumours in the lung, colon, prostate and breast. Leblond said a form of the device could also be incorporated into other instruments, such as specialized needles used for taking biopsies, to improve their accuracy; in surgical robots used to remove tumours in laparoscopic, or keyhole, operations; and for scope-based procedures such as a colonoscopy. In 2015, Petrecca and Leblond created a company, ODS Medical, to commercialize the device. The Montreal-based company has applied to the U.S. Food and Drug Administration for approval to market the probe, with the hope of it being widely adopted by cancer surgeons in other hospitals within a few years.